One Bedroom Cottage. Sleeps 5. Town Cove in Eastham. Private community dock. One bedroom plus pull out sofa (double bed) and chair (twin bed). Cozy cottage appropriately named Port Side which is nestled right on the water's edge of the Town Cove. It is a charming waterfront vacation spot that is more than comfortable with its present floor plan that can accommodate two to five people. Take your canoe or kayak and glide into the sunset from your own back yard. Just 20 feet away from Town Cove where you can, boat and sunbathe on the deck, private lawn or community dock . 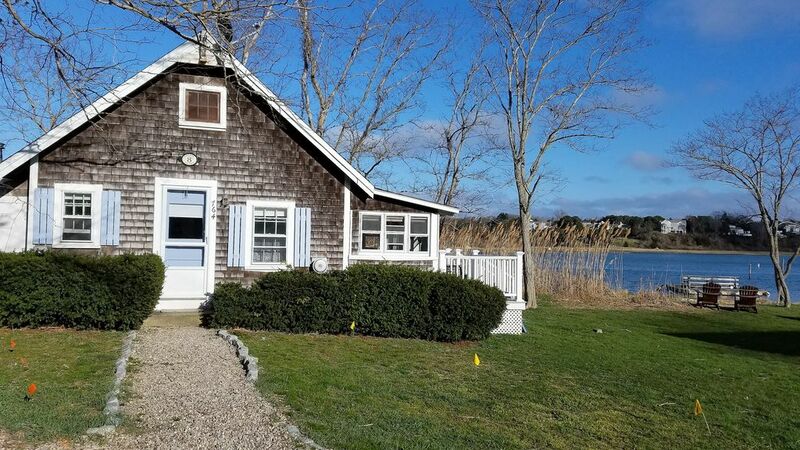 Enjoy gorgeous, expansive water views of the town cove from this tranquil, secluded cottage. Beautiful sunrises and sunsets right from your own door, bedroom and enclosed porch. The master bedroom offers view of the cove. This bedroom has a new full size mattress, small closet, and two bureaus. The cozy enclosed porch converts to a private bedroom for one person with a oversized chair that converts to a twinbed. Shelving, drawers and hooks to store clothes. Kitchen has a gas range and is fully stocked with microwave, toaster oven, toaster, blender, pans, pots, dishes, utensils and storage containers. Window over the sink looks out over the cove and the picnic table and gas grill. Living room has a LCD 32 inch color TV with DVD player and satellite TV. Broad band internet. Phone. Good cell phone reception. Couch converts to a very comfortable double bed with no bar! Bathroom has a full sized tub with shower. Modern water heater designed to never run out of hot water. Town water. Whether you are looking for that picnic for summer days, or a place for that romantic dinner, relaxing by the town cove or watching the sunset... so much beauty outdoors waiting to be discovered and you can experience it all sitting in your comfy Adirondack chairs by the waters's edge. Less than a mile and 5 minutes from Orleans amenities (shopping, dining, antiquing, theater etc.) and convenient to Eastham bay beaches and the National Seashore on the Atlantic Ocean. All the activities The Cape is famous for are minutes away. National Seashore center, Nauset Light, Coast Guard and Cape Cod Bay beaches, fresh and salt water swimming and fishing, whale watching, Audubon Society Wildlife Refuge, nature walks, Cape Cod Rail Trail for long bike rides, golfing, baseball games, museums, theater, art shows, cinemas, antique shops, restaurants, cafes and shopping. Historic Provincetown and quaint Chatham are within a short drive. We live in upstate NY on a small lake. We love the outdoors especially mountains for hiking and skiing and of course the ocean and The Cape. We have family on the Cape and love all the outdoor activities: beaches and low tide walking, biking the rail trail, hiking Wellfleet, fishing, and swimming. We wanted something on the water and Eastham on Town Cove is perfect. Less than a mile from all the amenities in Orleans and gorgeous bay beaches and the National Seashore are minutes away. You can put a canoe or kayak into the water right outside the door to the cottage. The cottage has a great bathroom for its size, air conditioning and a very functional kitchen. Outdoor grill and picnic table with views of the Cove. Long community dock to watch the sunrise and sunset. Great views and very private. Full bath (tub). TP and tissues provided. National Seashore. Nauset Light and Coastguard beaches. Cape Cod Bay beaches. Folding DR table against wall allows for indoor dining. Salt, pepper, sugar and simple spices like Old Bay, parsley etc. Blender, coffee maker, microwave, toaster oven, toaster, dishes, pots, pans and utensils. Napkins, paper towels and storage bags. There is a folding table and chairs in the living room. Not provided, but easy access to the Town Cove from the cottage. Rental available in Orleans. With two lounge chairs and four ADK chairs. Gas grill. The cottage was clean, functional and although in close proximity to Rte 6, the location was quiet and peaceful. Exactly what we needed for our quick Cape escape. Thank you! Thanks Luke. I really appreciate you saying it was as described. We tried to describe it accurately. hard to get in,all electric and tv,wyfi tured off we had to call and speak with owner to get things going.the owner was very helpful,thanks!! Not sure why electric was shut off. Glad we were able to get things going. Small but very quaint! Very comfortable and felt like a part of the Cape by staying in a cottage! The property was neat and clean! Had two air units that were greatly appreciated! Was in a good location and people around were very nice! Could use a few lifejackets for kayaking! Too hard to travel with them. Thanks Jackie, cute place! You’re very welcome Deborah! So glad you had a good time and good weather! Cozy- private- perfect for a couple. Lovely cozy space- quiet area- close to bike path (though be patient crossing 6). Really enjoyed. So glad you had a good time. Yes - Route 6 can be an adventure in the summer. Parking at Salt Water Pond or in Orleans helps avoid Route 6. Biking from Salt Water Pond to Coast Guard Beach is a nice choice too. Very sweet cottage , pretty views and good location. Great cottage for a week, great location ! Pretty views. You were a great guest too. For the first time we are vacationing here and the privacy is what we are enjoying. We just got some lobsters last night and ate them at the picnic table. Next year we are planning to renovate and we cannot wait! Although the place was small it worked for a family of 5. It was centrally located to all sites. The neighbors around the place are friendly. The one thing we had hoped is that the kids could swim in the pond. It's really only for kayaking and boating, but as I said the beaches are minutes away. Hi Christina - glad it worked out for your family. Point of clarification: the "pond" is Town Cove and leads into the Atlantic. We do swim in it, but understand there are better choices for young children very close by. The PTown jetty is a must. Hike Wellfleet Grand Island Trail. Orleans Bowling alley for great wings, BBQ, chowder and beer. Any bay beach at low tide.